Peterborough Sports Under 15s after winning the League Cup. It was a brilliant weekend for Peterborough Youth League high-flyers Peterborough Sports Under 15s. On Friday night they lifted the League Cup and then yesterday (March 12) they sailed through to the final of the PFA Cup. League Cup runners-up Glinton and Northborough Amber. 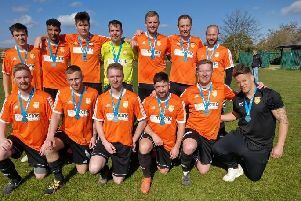 It was, however, far from plain sailing for the unbeaten Division One table-toppers against Glinton and Northborough Amber in the cup final at In2itive Park. In fact they trailed 2-0 at half-time and a huge upset looked to be on the cards. But Sports came storming back in the second half to win 7-2. Substitute Tychique Muendo fired a hat-trick with Jazleigh Fife (2), Bradley Gilbert and Nasir Nabi completing the rout. The winning Sports line-up was: Calum Arden, Olutayo Arinsanya, Jazleigh Fife, Bradley Gilbert, Lewis Lamberton-Pine, Nasir Nabi, Alex Pacey, Sean Spalding, Taylor Steward, Louie Venni, George Warrington. Substitutes: Josh Dunmore, Aaron Morling, Tychique Muendo, Jay Ward. Yesterday Sports hit big city rivals Peterborough Northern Star for six in the PFA Cup. They won 6-2 with Gilbert grabbing four of the goals and Calum Arden bagging the other two. Ashton Bennett-Williams and Will Palmer were the Star scorers. Sports need one more win from their four remaining games to clinch the Division One title.